To chill the wine and keep it cool throughout the meal, Peugeot has a stylish and clever range of wine coolers, with an elegant sleeve that is very simply wrapped around the bottle. 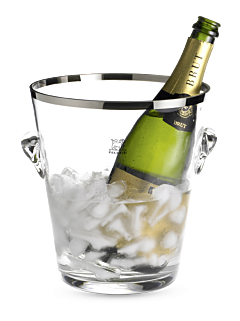 Cooling sleeve for wine and champagne 24 cm - 9,5in. Wine connoisseurs will agree: all wines should not be enjoyed at the same temperature, let alone at room temperature! The majority of red wines are served at around 18° in order to reveal all the intensity of their aromatic profile, white wines are served between 10° and 12°, Champagne between 8° and 10°, and rosé wines above 10°, with any other temperature altering the flavours. Nor should it ever be a question of causing a thermal shock with disastrous consequences by placing the bottle in a freezer or drowning the glass under a mounting of ice cubes that dilute the wine. Serving a wine at the right temperature is a challenge, especially when the unexpected happens during the tasting. This is why every Peugeot wine cooler has been designed with the utmost respect for the wine. Straight out of the freezer, it elegantly and softly cools and keeps fresh the bottle wrapped inside it. Solid, adaptable, high enough to enclose the whole bottle, and light enough to be transported, with its modern and elegant design, the Peugeot wine cooler is the ideal accessory for all tastings, formal or informal.